It is all too easy to stick to doing what is safe and comfortable and to not venture beyond this zone. There are tons of reasons why we don’t challenge ourselves: fear, priorities, self -preservation and often just lack of opportunity. The first three of these are all something one can control or manage, so when an opportunity presents itself, grab it with both hands – that is what I did. At the end of April 2018, Team TREAD where offered the opportunity to take part in this same year’s KAP sani2c. In all nine years of TREAD MTB media (formerly magazine), we have never once been offered this opportunity, so we knew it was special. With about two weeks’ notice, we had little time to prepare, but because I had been training fairly consistently since July 2017, my cycling fitness was fair. All I can say is thank goodness for our indoor power training sessions at Cadence in Bryanston. Doing just the 2 x 1 hour sessions a week and a few MTB rides a week too, made all the difference in giving me a reasonable level of conditioning to be able to say yes to the invite. So off we went, dashed out of Joburg around lunchtime on the Wednesday and chased the sunset to Glencairn Farm. The sunset won. None-the-less, the start village was abuzz with all the race snakes and predominantly male entrants for the sani2c Race. Registration, supper and unpack, then a quick night cap before settling into the roomy canvas tent. Roomy but good grief was it cold. The misty morning was so surreal, and the cold was no longer a bother. We frantically prepared for Day 1 on the bike. I didn’t really know what to expect, but I had my trusty teammate and husband with me, so I knew we would get to the finish. At about 30km in, I was asking myself “what am I doing?” “I’m ready to be done now!” “How am I going to make 80+ km?”. We took a bit of a drinks break at the top of a long climb, I gathered my racing mind, and just carried on pedalling. The finish line at the end of Stage 1 was a welcome sight, even though you can see and hear it from about 5km away! I had made it. The legs were tired but after a few recovery chocolate milks on the finish line, we were able to find our way to the tents. I thoroughly enjoyed my shower at Mackenzie Club, managed to book a quick leg rub and consume some delicious lunch before resting with the legs up for a few hours. The weather was behaving and the camp here was warm and relaxing. I knew that another long day lay ahead, but once again my nerves were intact at the start of our ride from Mackenzie Club to Jolivet, for stage 2. We conserved energy in the first part of the day as the fear of the Iconic Climb had been instilled in me at race briefing. But first we were treated to the spectacular descent into the Umkomaas valley. I had heard so much about this descent, and I do love a downhill. I found the switchbacks quite tame and the flow was over all too quickly. It did live up to its reputation with its breath-taking views from the top. And so, we headed towards Iconic. We had been advised by friends who had done the trails on the days before us, to take the Iconic route, so we did. It’s one hell of a climb and I tackled it in bite-sized chunks. And yes, I did walk. I would need to be a lot lighter and a lot fitter to consider riding the entire climb. 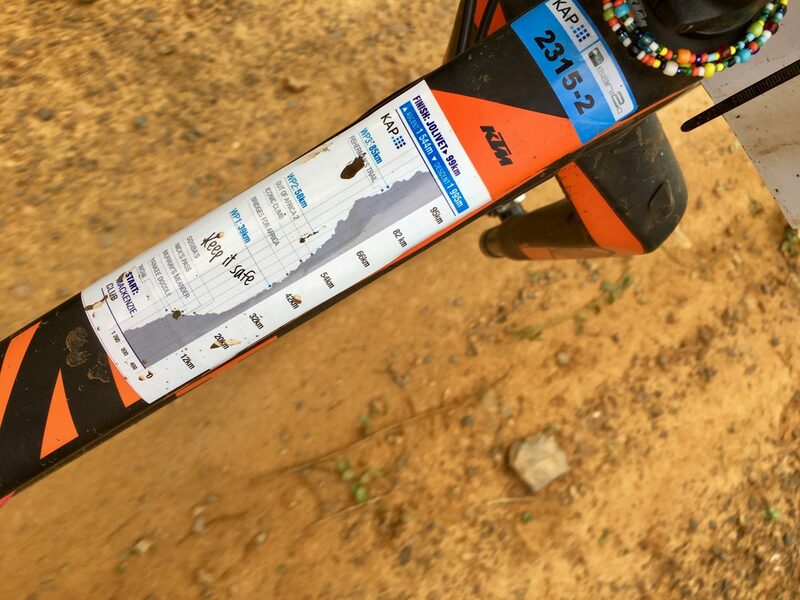 At the summit we were expecting a water point, but we had the incorrect route stickers on our top tubes (we somehow got 2017 edition stickers), so limped along an extra 10km to what we had anticipated, to a seriously welcome Waterpoint 2. Although pretty much out of fluids, I was feeling ok. Sean, my teammate, however had not replaced enough fluid or food earlier on the stage; and was desperately digging in my pocket for melted jelly babies and Speckled Eggs, and primitively shoving them in his mouth as we made our way towards this Waterpoint where we had a rather long stop. This was our most eventful stage. After the warm welcome over the finish line at Hlutankungu, we freewheeled with our fellow finishers down to the race village at Jolivet. Another awesome set up. I was surprised at how different each race village was. Jolivet being a more permanent structure than Mackenzie Farm. We repeated the same procedure as after Stage 1, and even though I still had Stage 3 to complete, I knew I would make it. We had stayed upright on our bikes and in my world (not Sean’s), we had finished each stage in a reasonable time. Stage 3 began with a little panic. As we checked the bikes my chain/gears just did not want to move. We had left getting onto the start line to the last minute, so we scrambled around for some lube, and after a few minutes my bike decided to behave. We were almost the last to exit the start chute, but we were on our way to the beach. By Stage 3 I knew the legs were going to be fatigued, but with courage in my heart and the commitment in my head, the day was just going to be a formality. I was on my way to completing my longest three-day stage event. I really loved the single track on Day 3, especially the forest section after Vernon Crooks Nature Reserve. After an overcast start, the sun began to dominate the clouds and with about 25km remaining the dreaded “feet of fire” struck. I don’t know what causes it, or what really helps. I needed the find water and get off the bike. All we could find was a muddy puddle – it would have to do. I managed to get my feet wet enough to reduce the pain, and we pushed on. The floating bridge on the river mouth at Scottburgh was so much fun, and we made our way up to the sounds of the commentators at the finish line. The last 2km was the hardest, but the feeling of elation crossing the finish line of my first KAP sani2c, with my husband at my side, will live with me forever. If you had asked me a year ago, if I would ride a sani2c, I would probably have said no. The distances seemed too long for me, and I had heard the trails were very manicured. Well, I proved myself wrong, I surprised myself and surpassed my expectation of just finishing the stages. I loved every minute of it, and the percentage MTB trails to district roads was ideal. The routes were spot on – manicured doesn’t always mean smooth! So, when you are faced with an opportunity in life, and it scares you, just a little, don’t hesitate, take it and make the most of it. Enjoy the journey that life lays ahead of you, because you just never know when that opportunity will come your way again. Don’t pack too many clothes. Besides your riding gear, you need something to sleep in and something to wear after Stage 1 and Stage 2 (which can be the same clothing as you don’t wear it for very long if you’re a middle or backmarker). There’s limited space in the race box, rather pack your own pillow and fewer clothes. Expect a long walk to the showers. But it’s a good time to absorb the great event vibe. Do a skills clinic or two beforehand. Being smooth and confident on singletrack will make the event more enjoyable. Take your training seriously. Day 2 is long and tough. Pick your partner carefully. You spend a lot of time with that person on and off the bike, including sharing a tent. Stop and take some photos, especially on Stage 2 as you begin to descent the Umkomaas Valley. It’s a truly incredible place to be. Day 1 is harder than you expect! Save something in the first half because the second half is surprisingly challenging. A note: support the events that help build mountain biking and the events that support the communities along the routes – it makes your soul feel “fit” too. Big thanks and shout out to all the incredible people who pull together to organise such fantastic events for us mountain bikers. The organising teams offer so much of themselves for these events. We in South Africa are spoiled for choice and have many first-class events on our calendar, all year round.